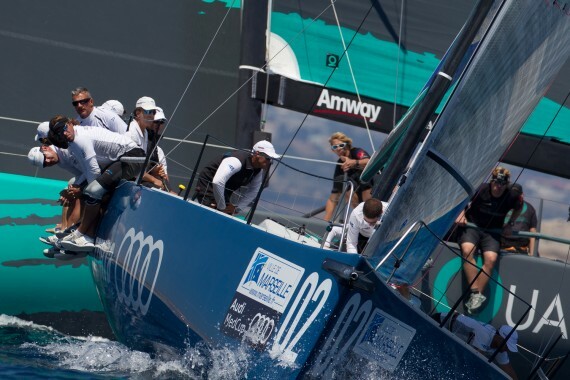 The first race in the Marseille Trophy has gone to Audi Azzura Sailing Team. The Italians powered off the start line and built a comfortable margin of 48 seconds by the finish of the windward-leeward course. Racing was delayed an hour due to the light and unstable breeze, but in the 6-9 knot south sou'westerly Azzurra benefited from the extra wind pressure on the left side of the course on the upwind leg to lead at the first turn ahead of Synergy and Bribon. Circuit leaders Quantum Racing were squeezed at the pin end of the line by Synergy but recovered to finish fourth.